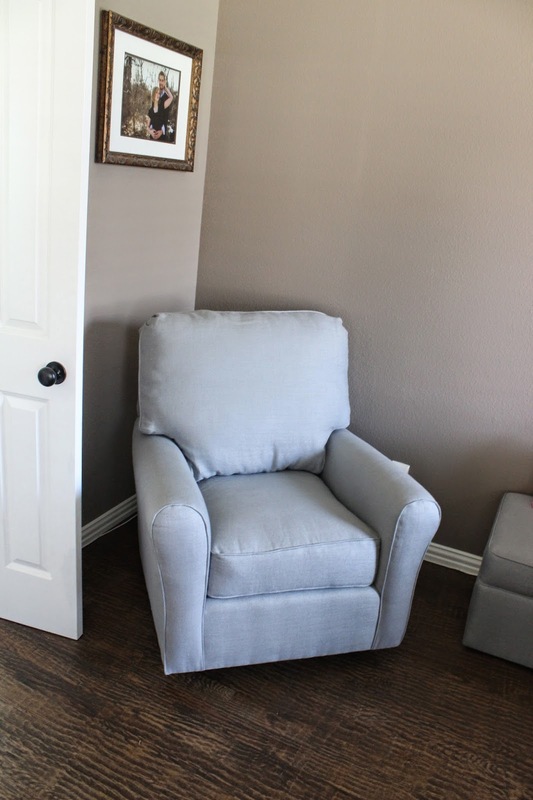 Nursery Reveal - The Mrs. & Co.
you may be asking yourself, ummm, Ashley where is the chair? Well here's the thing. I got the amazing idea last night to move the chair downstairs to our room so I can use it when she arrives. I wasn't planning on taking pictures till this morning when the room has the best light, so the chair missed the pictures. And I'm pretty sure Kyle would have killed me if I asked him to move the chair back upstairs just for a picture :) So here's a picture of the chair from my iphone (bleh!) but it's better than nothing! Alright, sweet girl, everything is ready for you! Time to get a move on!!! thank you! 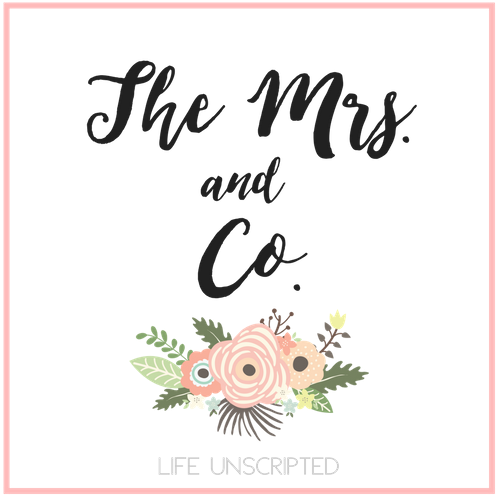 I am so pleased with how it all turned out! Looks amazing!! Good luck with everything that is to come!! omg that room is to die for! looks amazing!! love the colors, love the stripes, love it all! That blue looks alot like the navy blue we used for the boys! I love how you made it girly with the pink and the white. It looks great! Oh my gosh! It is so cute. Love it. Soo cute!! Great job!! Love the colors!! 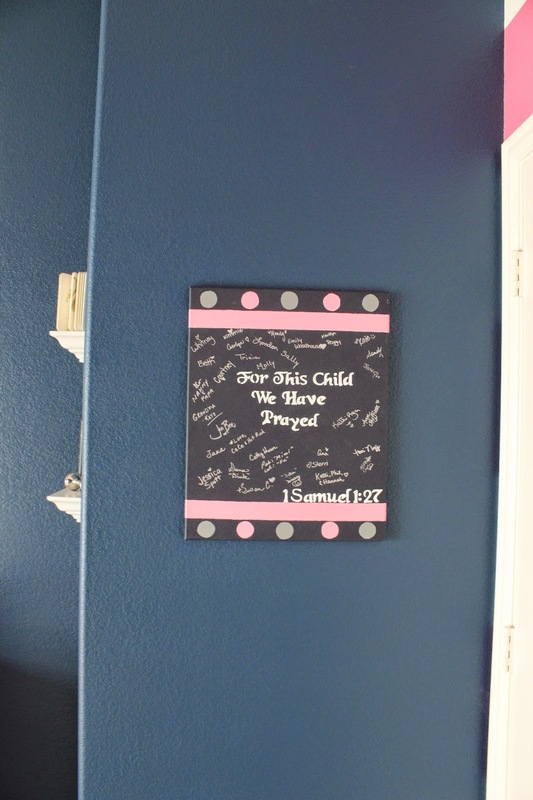 The pink really pops with the blue!! Cant wait for her to arrive!!! 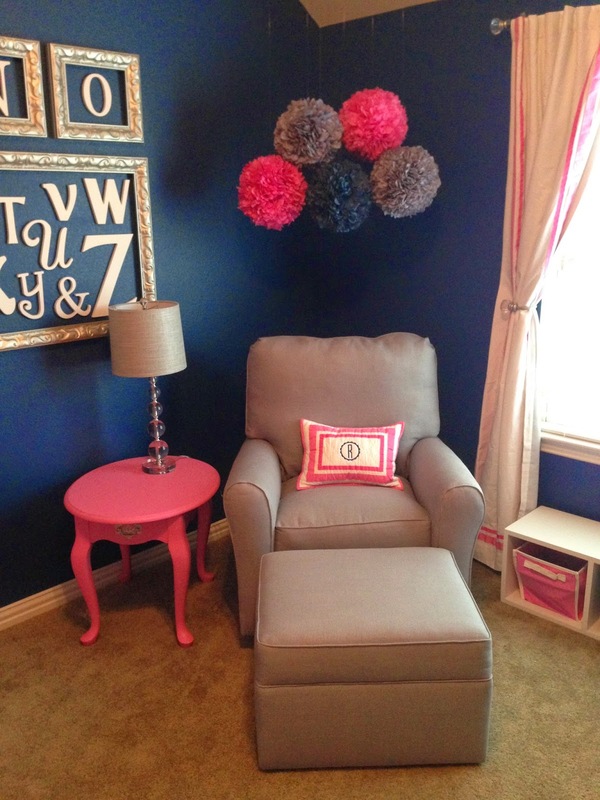 I can't get over what a great job you two did on her nursery! WoW! Love it! We are doing navy too. Looks great!!! Can't wait to see her sweet picture! This is so cute!! I am so excited for my baby too. I just got a baby shower from my friends in one of the best Venues in NYC and the husband is adamant that it’s time to prepare the pad for our little alien. You and the family have a merry Christmas and a happy new year! In all cases, health is very important. I am busy now with writing autobiography using these helpful advices so I don't pay attention on it.